Welcome to GP 100% Data Bonus Offer on Online Recharge. The Bangladeshi biggest telecommunication company Grameenphone brings a big internet bonus offer, whose name is the GP 100% Internet MB Bonus on Online Recharge Offer 2017. 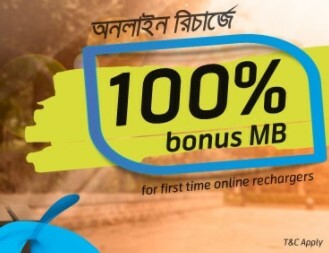 All the Grameenphone customers are eligible to enjoy GP 100% Bonus Internet Offer on first time online recharge. The GP Online Recharge 100% Bonus Internet Offer starts from 26th September, 2017 and end on 26th November, 2017. If you are a GP connection users and want to activate the GP MB Bonus Offer, just follow the below information. To know more detail information about the Grameenphone Online Recharge Bonus Offer, just go to the GP official website by clicking this LINK. Thanks for staying with us a long time and visiting GP Online Recharge 100% Bonus Internet Offer content. If you have any question about the GP 100% MB Bonus Offer, just comment here. We reply as soon as possible.